Legal hunting … solution, panacea or murder? I got, within a couple of hours, this reply. “I hear what you’re saying Swati, but unless we realise and acknowledge that there are people that need to earn money from farming rhino and create the environment in which it is legally possible and profitable, the battle is lost. I can see you don’t like to solution, but you should ask yourself what is more important: You opinion and feeling or the survival of the rhino? “First I need to say to you a thank-you. Often and often people reply with their egos! I truly appreciate your taking the effort. Mainly because discussion and education is what I think is probably the only real solution to almost any problem created by man. This is going to be a long reply and ask that you bear with me in patience. I do not have any claim to either professional knowledge, being an environmentalist or having a “holier than thou” attitude – not even being a vegan. A vegetarian, yes. I am also trying to be an ethical shopper. I certainly recycle my plastic and glass. I carry cloth bags to the market. But by no means do I have the right to preach. I do claim a right to air my views. And I am perfectly willing to hear all sides of a story. Not to sit in judgement but to be informed and thus to try to be a better creature on earth. So, in reply to what you say to me … yes, I can see that human beings need money to survive. We all do. We all have aspirations to improve our material lot. So – make money. Fine. But surely there are ways and ways to make money? Does it have to be at the cost of another creature’s life? 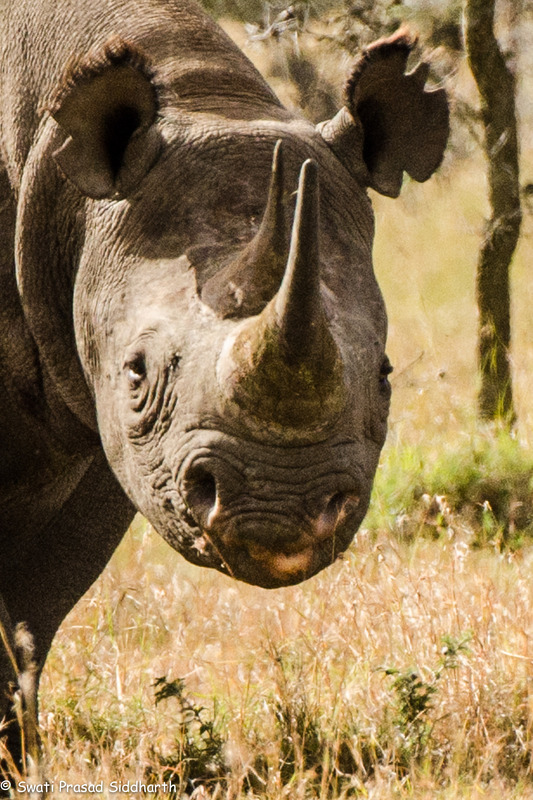 To say that the said rhino is old and will anyway be culled or be killed in the natural scheme of things and this may as well generate revenue – yes, its an emotional response when I say I don’t agree with this philosophy. To be perfectly honest, I have always believed we don’t have the right to take another life. Whatever form. This is nothing religious. Just a personal sentiment. So, am I thrilled with the above argument? No. Am I being idealistic in hoping people will give their surplus funds (and anyone buying anything at any auction has surplus funds, I am sure!) for the same cause without killing? Maybe. What is really wrong with idealism? We have got to a stage in our thinking where we justify violence. One man’s fight for independence is after all another man’s terrorist attack. So whose side do we take? And if we use the certain-death-can-at-least-be-profitable argument, are we not just one step away from applying it on fellow humans? Today its a rhino. Tomorrow it will be the fast dwindling ethnic races, tribals, aborigines … in some societies women and children!! There are after all plenty of countries where the male female ratio is lopsided, that are ageing populations … if its necessary to correct that balance someday, is this the kind of logic we will apply? Hopefully, this discussion will continue with no acrimony or will end for a happy reason! Yes. But please use the web as a starting point. Books are irreplaceable … The best you could do is search for good authors on the web, maybe even download ebooks, but please read in detail … Whatever the topic, knowledge is infinite. Just accumulating snippets of information from blogs of mine will never be sufficient! Read, read and read some more. And then, some more! as compared to books, as I found this piece of writing at this web page. Very interesting piece. My perspective varies from yours, but also from the comments people have written. I broadly agree with your philosophy but differ in the context where it should be applied – i.e. very few things, even ideals, can work in every context. In this case some fundamentals of population ecology must be applied, a context which applies as the rhinos are not ‘free’. It’s referred to as Rmax (the maximum rate at which a population can increase). Artificially removing individuals from the population can increase the breeding & survival rate overall. For black rhinos it is critical we achieve this. Sadly these animals can no longer be subject to the natural processes – people created the problem and now others have to fix it. I would also say that for the people who made the decision to allow the hunt, such as the rhino managers, it is no easy thing. I have been in the same situation myself with other species and it is terribly hard to have an animal killed, but when you see 5 newborns as a result it can help.